THE FEDERAL SWITCHBLADE ACT OF 1958 (FSA) BANS ALL AUTOMATIC KNIVES (SWITCHBLADES). The FSA does not inhibit or restrict your ability to carry an automatic knife in any way. It only prohibits manufacturers and vendors from commercially selling automatic knives across state lines. Also, the US Customs Service applies the Act to prevent the importation of automatic knives, and parts for automatic knives, from other countries. INDIVIDUALS MAY NOT OWN OR CARRY AN AUTOMATIC KNIFE UNLESS THEY ARE LAW ENFORCEMENT OR MILITARY. The FSA does not inhibit or restrict your ability to carry an automatic knife in any way. Because there is no federal restriction on the possession of an automatic knife, states have the right to establish their own laws regarding automatic knives. Currently, individuals may own and carry an automatic knife in 43 states. (See the map on the reverse side.) Some states have restrictions such as blade length. Several states are currently considering bills to allow automatic knives or remove restrictions. 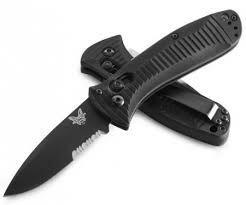 THE FEDERAL SWITCHBLADE ACT PROHIBITS SENDING AUTOMATIC KNIVES TO INDIVIDUALS IN OTHER STATES OR WITHIN YOUR STATE. The FSA only prohibits your ability to send automatic knives through the postal service. It makes no restrictions on shipping knives using the other carrier services as long as it is not being sold across a state line. AUTOMATIC KNIVES ARE A DANGEROUS WEAPON USED IN MANY CRIMES. Automatic knives are a valuable tool in many situations where it is difficult to use two hands to open the knife. A study completed in 2015 found that there was no evidence in states that allowed automatic knives that crimes of murder, robbery or aggravated assault increased compared to periods before and after automatic knives were illegal and then legal. AKTI is removing automatic restrictions state by state, working to enact federal law to protect the rights of knife owners who travel between different states and jurisdictions, and to remove the commerce prohibitions of the Federal Switchblade Act. Learn more about State Laws Regarding Auto-Open Knives. Support AKTI with your membership and contributions.